The Toronto Star recently ran an article discussing a report released by the Canadian Feminist Alliance for International Action (CFAIA) and the Canadian Labour Congress. I could critique the usual fear-mongering and misuse of statistics in their report, or postulate on why a labour union was involved in its creation. 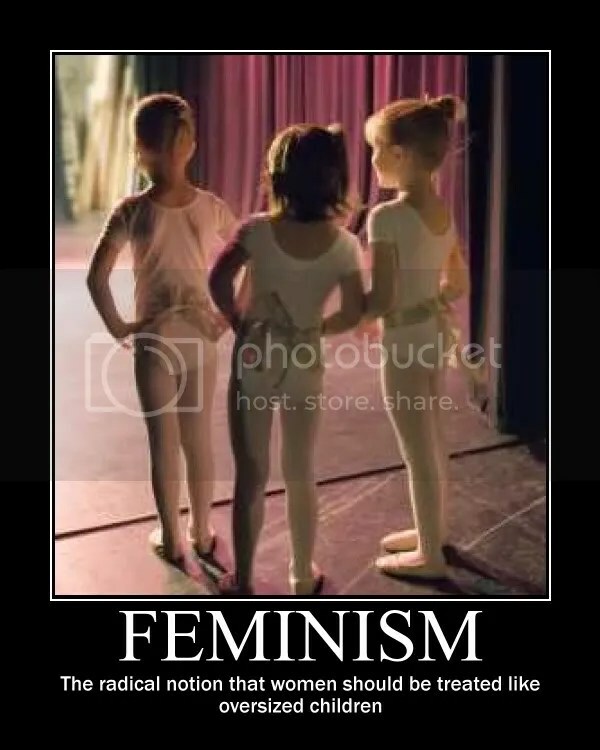 However, I think a more useful approach is to focus on feminism as a whole. In their earliest forms, feminism and women’s liberation were noble movements. They sought to give women equality, legal autonomy, self-determination, and freedom of choice in a broad range of topics from reproduction to employment. However, in more recent years, the agenda of feminist activists seems to have less to do with giving disadvantaged women a hand up and more to do with giving them a handout. Activists wail and beat their drums, blaming everything from men to weapons to government for the plight of subjugated women everywhere. They ignore the fact that portraying women as helpless victims of society undermines the entire concept of feminism. They also ignore the fact that men and women are different. While striving for total equality is noble, it’s also a pipe dream. Men and women are not equal and they never will be. There are very definite physical, emotional and mental differences between the sexes. Some roles in our society are better suited to women, others to men, and no amount of government initiatives will ever alter that fact. Should women have the opportunity to tackle any societal role that they choose? Absolutely. However, so should men. While there are still traditionally male-dominated areas where it’s difficult, if not impossible, for a woman to break through, the same holds true for men. This brings up another concept that modern feminist activists refuse to acknowledge: that men suffer too. In their world, violence or discrimination against a woman is a human rights abuse, but violence or discrimination against a man is not just normal, it’s acceptable. The divisive tactics used by feminist activists show that they have another agenda that has nothing to do with bettering the lives of women. If they were truly interested in bettering our society, they would be looking at ways to improve the quality of life for everyone, not just women. Taking a slightly different tack, in the Star article I mentioned above, wage parity (or lack thereof) in Canadian society is brought up. I’m not going to touch on the fact that the professor quoted in the article is focussing only on wages as an indicator of quality of life. Instead I’m going to point out how feminist activists, as usual, fail to take into consideration 3 very key issues that cause such a discrepancy in earnings: choice, childbearing and communication. Many women simply choose not to go into higher paying (and traditionally male-dominated) fields. The reasons are many and varied: it may be a career that is better suited to men, women just aren’t interested, or if they are in the field they’re unwilling to do what’s necessary to earn their place. You see, equal opportunity isn’t something that can come from government handouts or special committees. Like men, women need to push through obstacles on their own and prove that they are capable of doing the job. I’ve worked in a male-centric field my entire adult-life and I’ve encountered many seemingly “backward” or “sexist” attitudes along the way. I know my male readers are going to love this, but men really are like children 😀 They will regularly push the boundaries to see what they can get away with. Women planning to work in a mostly male environment need to learn how to thrive in that environment. There are many tricks and tools that are far more effective than crying “harassment” and seeking disciplinary action. Gaining acceptance isn’t about running to management to complain that your male co-workers aren’t playing nice and trying to demand their respect simply because of your gender. It’s about earning their respect based on merit. Connected to Choice is the second item I mentioned: Childbearing. In 60% of two-earner families, one partner works full-time while the other either doesn’t work, or works part-time. In 91% of those families, the man is the primary breadwinner. [Source: Statistics Canada, Family Work Patterns] It’s pretty simple. Women who have children work less, which means they have less work experience than their male co-workers, which means they will earn less. I can already hear people complaining that women are being “punished” for having children. Quite the contrary, it’s actually very equal. Like their male co-workers, they’re being paid based on their recent relevant work experience, rather than being given a handout simply for being female. My last point is communication. Many a book has been written outlining the differences in communication styles between men and women. In general, men tend to be more direct and ask for what they want. Women tend to use a more subtle approach. Over the years I’ve seen the following scenario happen time and again, not so much in unionized employment, but definitely in the private sector: Joe and Jane start working in the same job at the same company at the same time earning the same wage. Five years later, they’re both in the same job, but Joe is now earning more than Jane. Another 5 years down the road, Jane is still in the same job, earning only slightly more than when she started, while Joe has been promoted and received a raise…twice! The modern feminist would have us believe that this is a perfect example of inequality in the workplace. On the contrary, it’s a perfect example of a skill that women need to be taught in order to be successful in the workplace. Why is Joe doing so much better in the company than Jane? Because he asked. Women will toil away at a job for years, expecting their boss to notice their hard work and offer them a raise or promotion. Men will simply go to their boss and ask for it. Much progress has been made in the quest for women’s rights over the last 200 years. Laws have been made and repealed; cultural norms have been challenged and changed. Government legislation has gone about as far as it can go. It’s now up to women to pick up the flag and run with it themselves. Instead of undermining their own efforts by portraying women as victims, feminists need to start taking a more positive and proactive approach. Rather than wasting their time and energy lobbying for sympathy and handouts, they should be teaching women the skills they need to succeed. I read with a combination of interest and dread, the news story on couples petitioning to have In Vitro Fertilization (IVF) covered under Ontario’s health plan. Interest to see what the outcome is; dread because I’m already fairly certain what the outcome will be and where that will lead us. Socialized healthcare is a complicated issue that raises difficult moral and ethical questions. What should be covered and what shouldn’t? Who do you treat and for how long? Where do you draw the line? I work in healthcare in a major hospital that has one of the busiest Emergency Departments in the country, seeing over 200 patients per day. The majority of these patients aren’t ill enough to even justify a visit to their GP, let alone make use of a hospital ER. So why do they come? Because it’s free. Our healthcare system has bred a generation of hypochondriacs who go to their doctor or their local hospital for things as innocuous as a mild cold or a papercut or just because they’re lonely and want to chat. They insist on being checked out for every minor ache or pain – just because they can. Add in the growing culture of entitlement and you now have a recipe for disaster. As it is, our healthcare system can barely cope with medically necessary procedures. If we start adding in frivolous procedures like IVF, our system is destined to collapse. I fully understand that to a couple struggling to conceive, IVF is far from “frivolous”, but there is no question that it is not a medically necessary procedure. We simply cannot afford to go down the route of catering to everyone’s needs. The role of the government is to maintain order, not to spoon feed a population that is unwilling to take responsibility for their own lives. By no means am I advocating a US-style system of healthcare. They have a completely different set of problems to deal with. There has to be a blending of private and public healthcare systems, or at the very least, instill some sort of “user pays” set-up in Canada. There are many options. It could be as simple as charging a nominal $10-20 fee for a doctor or hospital visit. That alone would eliminate much of the abuse on our system. Then there’s Germany’s model where those who lead a healthy lifestyle receive a refund from the government, while those who actually use the medical system pay top dollar. Personally, I like Australia’s private/public system – it encompasses the best of both worlds. With the number of bright minds in our country, I’m quite certain that they could come up with something workable. The bottom line is this: with a decreasing tax base and aging boomers putting more and more pressure on our healthcare system, our current model is unsustainable. If we want to continue to have socialized healthcare in this country, the people in charge need to start making some of those difficult moral and ethical decisions that they have been avoiding for the last 40 years. If they are unwilling to make those decisions, they had best come up with a new healthcare model. Fast. If we continue on our current course of including everything and denying nobody, there is no question that we will bankrupt our country. As a population, we need to take off the blinders and be realistic. We can’t have it both ways. If we want the government to be responsible for our health and well-being, then we have to allow them to make the tough decisions required to maintain that system. If you don’t trust them to make those decisions, then socialized healthcare can never work.